The McKinsey Problem Solving Test (also known as the McKinsey PST) is a math computation, data interpretation and logical thinking test used by McKinsey to determine which candidates are granted a first round case interview. In general, candidates whose resumes McKinsey deems acceptable are invited to take the test. Based on feedback from hundreds of test takers, you must pass the test in order to get the interview. There are few to no exceptions to this rule. 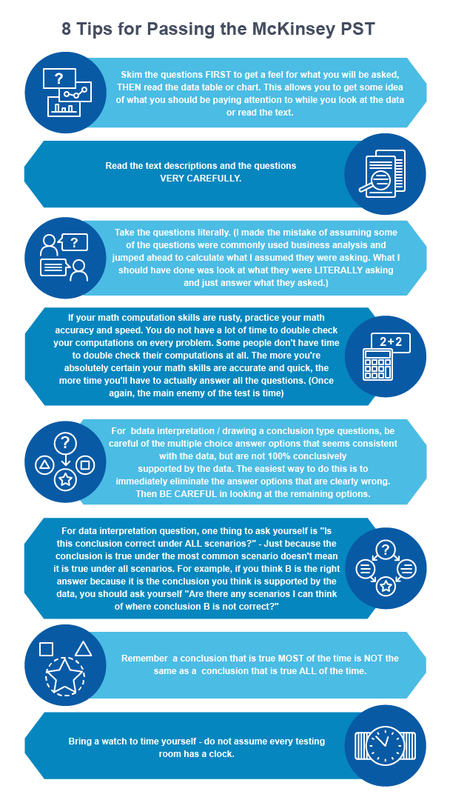 The reason McKinsey uses the test is because there are a certain set of numerical computation and logical thinking skills required to be successful in consulting. While standardized math tests like the quantitative sections of the SAT, GRE, or GMAT do test math computational skills, it is possible to get perfect scores on these math tests but fail on the job in consulting. It's my interpretation that McKinsey developed the McKinsey Test in order to test those skills that regular math tests do not adequately evaluate. In particular, these skills involve data interpretation and critical numerical reasoning. Now when I hear the words "data interpretation" and "critical numerical reasoning", it always reminds me of those college entrance exam tests that were challenging, seemingly arbitrary and pretty much not useful in the real world. But, it turns out these skills actually have a very practical purpose while working as a consultant. 2) Grasp what the "data is conclusively telling you" and separate from what the "data is suggesting (but not definitively so)"
In other words, you end up using these skills every single day as a consultant. And if you use these skills incorrectly, then either your manager or partner has to redo your work for you (which means at some point you will get fired) or the client notices the logical flaws in your work and it makes your firm, your partner and your manager look bad (and of course means that at some point you're going to get fired). Now you would think looking at a chart and writing a powerpoint headline is not a very difficult skill. I mean anyone can look at a chart and write a headline, but you would be surprised by how many people actually get the headline wrong. In other words, a LOT of aspiring consultants and even some first year consultants see that data and come to the WRONG conclusion. From a McKinsey partner's point of view, it's a complete disaster if someone on your team lacks this skill... or even worse THINKS he has the skill, but actually doesn't. 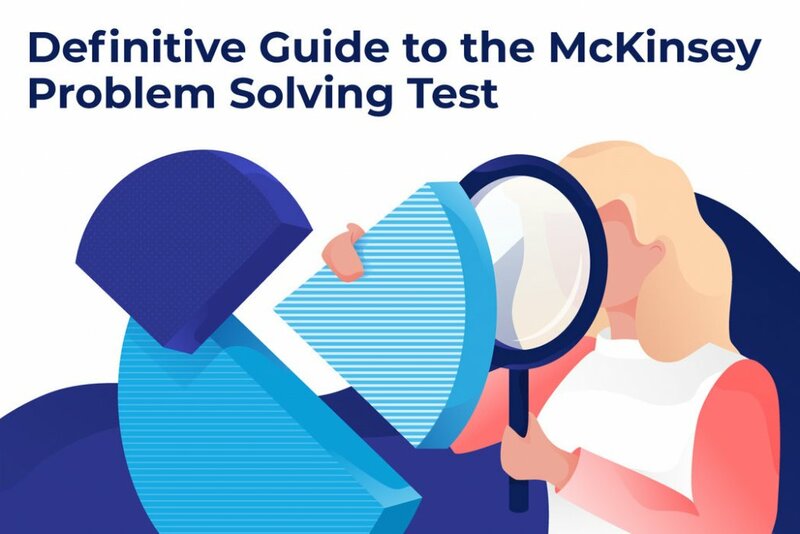 It is such a big deal that McKinsey has gone to extensive effort to create this test and have thousands of candidates around the world take this problem solving test. All of this effort is taken for the sole goal of hiring new consultants who can do 1) do math accurately, 2) do it quickly, and (most importantly) interpret data CORRECTLY. In short, being able to solve problems logically is a BIG DEAL. The computer-based test consists of approximately 26 questions and lasts 60 minutes. No business background is needed to take the test, but being familiar with a few commonly used business terms is useful (see the McKinsey PST Frequently Used Terms section of Part II of this Guide Below). You are permitted to use pen, pencil or paper. No calculators or computing devices are permitted. 1) Math Word Problem - Given the data in Table X, calculate A, B or C.
A, B or C might be profit margins. It might be figuring out which company's profits were larger two years ago. It might be calculating the difference in sales from today vs 2 years ago for two different companies - and figuring out which company had the bigger change. In the US, we call these "word problems". The purpose of these problems is to give you raw data and information conveyed in a text paragraph, and see if you can figure out the math equation needed to solve the problem. Often the actual math computation isn't difficult (its just addition, subtraction, multiplication or division; often math problems are based on percentages - growth rate, cost expressed as a percentage of sales, or profits as a percentage of sales, sales of this year vs 3 years ago expressed as a percentage). What makes the word problem difficult is a) Time, b) Time, c) Time. Amongst those who pass the McKinsey Problem Solving Test, the consistent feedback was they finished with barely enough time. The most common reasons for making a mistake for a math word problem is misreading, misunderstanding, or misinterpreting the data presented or what the question was asking. The other big reason is computational error. When I took my first McKinsey PST practice test, I actually missed several problems. To be fair, I had a newborn baby in the house and was sleeping 3 hours a night at the time, and I made a LOT of careless errors. My mistakes: I thought they were asking one thing, when they were really asking another. I rushed the computation, and made mistakes. 2) Data Interpretation - "Given X chart, which of the following conclusions are accurate:"
The other type of question isn't computationally intensive, but rather tests your logic and critical reasoning skills. You will be asked to refer to a chart or data table (mini spreadsheet with numbers) and asked some variation of the question: Which conclusion is correct? Variations of this question including presenting you with potential answers that are a) definitively correct, b) could be correct but you can't be 100% sure, c) definitely wrong. The answers that are trickiest are ones that seem consistent with the data, but is NOT completely conclusive. In other words, you need to be able to look at the data and tell the difference between a factual conclusion vs. a hypothesis suggested (but NOT 100% proven) by the data. Skim the questions FIRST to get a feel for what you will be asked, THEN read the data table or chart. This allows you to get some idea of what you should be paying attention to while you look at the data or read the text. Read the text descriptions and the questions VERY CAREFULLY. For data interpretation / drawing a conclusion type questions, be careful of the multiple choice answer options that seems consistent with the data, but are not 100% conclusively supported by the data. The easiest way to do this is to immediately eliminate the answer options that are clearly wrong. Then BE CAREFUL in looking at the remaining options. For data interpretation question, one thing to ask yourself is "Is this conclusion correct under ALL scenarios?" - Just because the conclusion is true under the most common scenario doesn't mean it is true under all scenarios. For example, if you think B is the right answer because it is the conclusion you think is supported by the data, you should ask yourself "Are there any scenarios I can think of where conclusion B is not correct?" Remember a conclusion that is true MOST of the time is NOT the same as a conclusion that is true ALL of the time. Bring a watch to time yourself - do not assume every testing room has a clock. The biggest challenge for developing your problem solving skills is there aren't many McKinsey PST practice test that are at a difficult level equal to that of the actual McKinsey Problem Solving Test. For a full list of practice tests available online, fill out the McKinsey Practice Test List - Request Form below. Below are tips and resources for each of the practice methods. The first method is to practice the speed and accuracy of your arithmetic. The McK PST is a TIMED test. This is not the kind of math test designed to test the entire population of people with a wide range of math skills. It is intended to identify only those who are very good at math, logical thinking, etc... If you are really good at math, you will finish the test BARELY. So even if you have a PhD in Physics or Math (I'm being serious on this), it is VERY IMPORTANT you practice your math computations. I get many, many emails from engineers who had 4.0 GPAs in school who did not pass the PST. Your math computation skills are a muscle. The more you use it, the stronger it gets. Keep in mind even if you calculate an integral effortlessly, it doesn't mean you can't make an error doing basic computations. This tool compares your math accuracy and speed to other CaseInterview.com members and to my own test results as benchmark. This will help give you an idea of how your math skills compare with others; and whether or not you need to improve your math speed and accuracy to be competitive, or if you current skills are sufficient. In addition to practicing math computations, you want to practice and develop your data interpretation skills. For data interpretation, the practice questions that most closely resemble PST questions are practice test questions from certain sections of the GRE. In particular, I would recommend practice "word problems" and "data interpretation" type GRE questions. Keep in mind the actual McKinsey Problem Solving Test questions are harder and more sophisticated than the word problems and data interpretation questions in GRE. Sometimes the questions are combined -- word problem + data interpretation. Other times instead of presenting a straight forward problem, as you would see on the GRE, you'll see a more elaborate scenario (or multi paragraph story with one or more charts) where you have to figure out what information is irrelevant to the specific question at hand. Remember, each chart is referenced by 4 - 5 questions. So for any ONE question, most of the information presented is NOT relevant to THAT particular question. But before you work your way up the elaborate questions, polishing your foundational skills in word problems and data interpretation is a good idea. Because GRE problems are much easier than the PST problems, you need to balance the nearly unlimited practice questions (that are too easy) available for the GRE vs. the much smaller pool of practice problems for the PST. In addition, there are only a few PST practice tests available online for free. The other practice tests available (including the ones I offer) do have a fee. Additional Note: As of June 5, 2012, the GMAT is being revised to include a section on "Integrated Reasoning". From my assessment, this section of the GMAT has many similarities to the McK PST. If anyone has any experience with this version of the GMAT or as the test prep guides are updated to reflect this new section of the GMAT, please post your experiences below and I will incorporate the feedback into a revision of this guide. The following are links to a few McKinsey PST Practice Tests. Note: The consensus feedback from reader Field Reports is the actual McKinsey Test has a lot more reading than the samples posted above. My takeaway from this is that its important to read the questions FIRST, then read the text and charts. Keep in mind you are not reading a magazine article or a business school case. Your only mission is to answer the questions asked and to move on... QUICKLY. With that in mind, I recommend reading with a PURPOSE in mind, as opposed to just for general knowledge. In other words, KNOW what you're looking for BEFORE you read. Then read carefully while hunting for the data you KNOW you will need to answer the questions. To receive these free resources, fill out the form below. The actual test does not match the practice test in terms of level of difficulty, but it cannot be said that it is harder. Some questions are harder, some are easier than those given in the practice test. But the practice test gives you a feel of the type of questions and timing. In terms of preparations, I only solved the practice test and then compared my answers to the correct ones. Then I worked out the wrong answers slowly to realize where did I go wrong. When it comes to the attitude, it is important to go to the test with a positive attitude but with the expectation that very few are those who actually make it. Going with a "Why-not; let's take a shot" attitude will alleviate a good portion of the stress associated with the tight timing and will allow the candidate to think clearly. For non-business students, brush up on few quantitative business concepts before going to the test, it is said that it does not require a business knowledge, but definitely some business sense and acumen. Stress will definitely play against you, RELAX the test can be completed in the allotted time, don't worry about it.You will be marking the 26th answer by the end of the last minute though. Make sure you complete all questions, there are no penalties; but this we know. What we don't know is, even when you are taking a question as a guess, the test is tailored such as it will allow you to take an informed guess which is correct; so use elimination and educated guesses to your advantage. Very few people get into McKinsey, put this information into perspective and go to the test in a 'Game' frame of mind, enjoy it; it is nice and stimulating. Relax, breathe before starting the test and remember if you made it so far and your consulting resume caught McKinsey's accurate eye, it means you mostly have what it takes to pass. Do not stress about the outcome of the test once you leave the room. Mckinsey will get back to you shortly; they have the best recruitment system in the world and they do not make people wait, I know people who knew the outcome as early as 24 hours after the test. A great thing that is a MUST-KNOW about McKinsey, they do not select the top x% performers. They have a cut-off score, if you pass it, you're in for the interview process; you're not competing against anyone, you're only invited to stretch your own potential. One last note I would like to add, you will get out of the McKinsey process feeling great, whatever the outcome is. These people are amazing, this company is extremely professional; and they make you feel appreciated and respected at every stage of the recruitment process, whether you make it or not. So my point: get the best out of it for yourself. Note: Concerning the PST test, I found that the best way to get the answer for a question is by applying a similar analysis to a case interview. That is, when asked about something, the best way is to actually think of a hypothesis and what kind of data is needed to give the answer. And then look for the data in the text. I found that pretty useful. I felt like sharing this as a tip. Finally, if you haven't already requested part II of this guide to the McK PST, you can do so by filling out the form below. I want to share with my experience as this site helped me a lot in preparing. I took the PST in China today, and I got a feedback onsite immediately. They told me I had got a pretty high score in PST…. However, three days ago, my score on the first practice test was 16/26. What I did is digest every single answer to question in practice tests. My score increased very much through practice 1 to 3. Today, I got the three cases as aboved mentioned: diabetic treatment, vehicle plans and shoolbooks. I finished all the question 5 minutes earlier. I personally feel the real test, at least the one I took, was MUCH easier than practice tests! Only one question envolved intensive math calculation, and for sure I came back to the calculation after finishing all the rest questions, without panic. If you digest all the questions in the practice test, you will find some routines in Mckinsey’s littles PST tricks. Good luck to all the applicants. If you prepare the PST serious, you will pass it. Great news…and hopefully wewill work together in future at McK.. When you say intensive math calculation, what do you mean? can you give an example? what was your approach in solving it? I’ll take the PST and numerical agility test by the end of this month (I’ve applied to the Italian office). Has anyone experienced it so far? What should I expect? Is it GMAT-like or just a numerical/psychometric test? A) He does not approve of the CEO’s proposal because the up-front cost for the plan is so huge while Zale needs capital to invest into the development of their fashion brands. B) He asks the CEO to reconsider his proposal and think carefully about the allocation of its limited budget for Zale’s projects in the coming years. Anyone have any information about McKinsey the London office at the moment? I got invited for online numerical and verbal tests a week ago and still no reply. Did anyone got an invite for PST or interview for the London office? I am doing the test tomorrow – have only done the 2013 practice one online. I have had crazy midterms and whatnot. Anyone taken this year’s exam yet – if you are reading this and wouldn’t mind replying to my message, I would be very grateful for any advice. I am particularly worried about the maths element of the exam. Today I gave my PST. Dose anyone know how much time Mckinsey takes to release the results? Has anyone encountered this new online math test McKinsey is starting this year? Apparently this replaces the PST? Does anyone have info on what it is and how to prepare? I’m writing my test today at their South Africa offices. I’m nervous about the numerical questions because I’m a law student and don’t deal with numbers much. Hi, I am writing the Mckinsey PST on Monday – how do I master it? I was invited to take the PST test at the McKinsey Paris office. I am still waiting for my result (fingers crossed). I spent 8 days practicing with an average of 3 hours/ day. I solved a total 0f 10 PST case studies I bought online and 3 practice tests (provided by McKinsey). I was averaging 22-24 on each test or (3 case studies). The actual test is similar to the Practice Tests provided by McKinsey but with more data to read and slightly tougher questions. The recruiter stressed on completing all questions so I began with the last case study because I believe a huge aspect of grading is dependent on how well you do on the final couple of questions because it gives the grader an idea on whether you were stressed on time and guessed or you actually had time to solve. I Finished 26 questions in 50 minutes and this is mainly because of mastering the strategy on how to approach questions and guessing based on little calculations, I gained that knowledge basically from practicing a lot. My advise is: (1) practice a lot to get a feeling on how to approach Fact-Based, Problem Solving, Root-Cause, Client Implementation, and Reading Facts questions, (2) time each test, (3) RELAX and GET SOME SLEEP, and finally (4) work on your guesstimating skills. Will update you once I get any result. Wish me luck…. I just sat the PST 2 days ago and I’m pretty sure I haven’t made it through, yet to receive the e-mail though. I got an e-mail saying I was rejected after I thought it was a formality i’d be sitting the test after attending an event and meeting recruiters Int’l head of recruiting etc. Then got another e-mail 2 days before the test and had absolutely no time to prep + had other commitments so was extremely under prepared. There was a technical problem apparently with the system which meant I received it late. Tried to get it rescheduled but couldn’t, the only other time which was a week away clashed with one of my module assignments (counts towards grade). Very frustrated with myself frankly as I don’t think I will ever get a better or even another chance. Just wondering what is your experience with those who fail the PST. Is there hope of getting another chance to redo the test if I reapply next year based on my situation? Or will the test result count against me? How would you advise I approach the situation? Contact them by e-mail after I get the rejection e-mail, address in cover letter next year? Thank you all for your comments and sharing your experiences. I wanted to know if anyone has take the PST in Australia? Has anyone sat the McK PST test in the last few months? I am sitting it in February (2017) in Australia. I’ve taken the PST this week and I have not passed. I did the tests of the McKinsey webpage and I’ve done many math exercises from this webpage. I highly recommend you to do both. I also bought the book Case Interview Secrets by Victor Cheng but I consider it useless in order to succeed the PST. It is better to purchase it when you have to prepare yourself for the following stages. PST McKinsey test: I found it easier than the samples that are on the web. If you practice, time management is not a problem. I have a question related to one of the McKinsey PST practice tests: The Kosher Franks example. In Q2, “Which of the following measures, if done alone, would definitely not help address the objectives of the CEO of Kosher Franks?” ….Hypothetically, lets assume that the Annual Average revenue growth of the Other Products in a Table 1 was – 10%. In this case, the option C will no longer be applicable because removing the -10% decrease in sales will achieve his/her objective…Is my logic sound? 3. My consulting coach’s practice test (they have 3). I personally think this one is closest to real test in both the logic the solution explains and the complexity level. I saved 1 to do the mock before the test day. This package was well designed that it shared some short cut in terms of calculation and graph reading which other material didn’t share. 5. For the math part: you can use the Victor’s math tool however I found the % part too easy for PST, so I designed my own version of calculation practice in Excel using rand() to generate random number. Every time I practice I time myself and summarize the error that I made to identify the root cause. Tips to do the practice test: deep understanding matters most. For the questions that I did wrong, I first tried to understand what the right way was to solve it; next why I didn’t come up with the right method. The goal when you reflect on those questions are to find practical tactics that you need to use during the real test. It might be some logic that you didn’t know before; might be some habits you need to adopt like writing numbers more organized during calculation. Identifying the root cause is not the purpose; the purpose is to (1) make up some business logic that you didn’t know deep enough before (2) form a standard habits/process of solving PST problems. At first, I worried about the time control very much; latter I figured out the key is to boost the right-first-time answer ratio. First, seek to understand. Then speed. I practiced the test one case by one case and to start out I didn’t time myself till I felt more comfortable with what were tested. At the end of the day, you will find no matter what you will fill 26 question’s answers in the answer sheet (worst scenario is you will guess a lot … ); however the thing that will determine whether you pass or not is the accuracy. I did about 3 cases w/o timing and then begin strict timing ( I bought an digital stop watch and used it during the test as well). Timing is to help you to know when to giving up and later the reflection can teach you how to do it right. During the preparation, I sometimes felt I was in the darkness. These comments left here gave me lots of insights and momentum to move on. I want to thank all the people who wrote here sincerely! If you practice in the right way, you don’t need luck to pass the PST. But still, good luck! I took the PST in paper form 6 years ago, passed, and successfully joined the Firm. In my opinion, you can only practice this test to a limited extent. Of course, do the practice tests, and follow standard best practices for test-taking (know the location of the testing site, arrive well in advance, pace yourself, bring a watch, get enough sleep the day before the test, read questions quickly before starting to answer). It is hard to prepare specifically for this test, unless you train the underlying skill (eg fast, accurate mental math; abstraction; synthesis) which takes significant time and effort and is too late by the time you have the test scheduled.